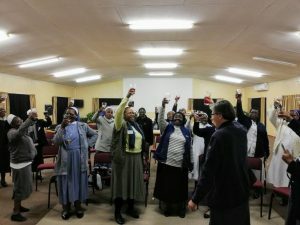 From 11 to 14 May 2018, 8 congregational leaders and their teams gathered at Lumko Institute in Germiston to attend a leadership workshop arranged by the LCCL. 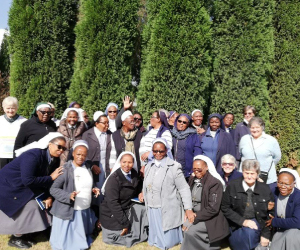 31 participants participated in this workshop facilitated by Sr Celia Smit OP and Sr Goretti Rule RSM. The workshop’s objective was to equip the participants with leadership skills while facilitating team performance. 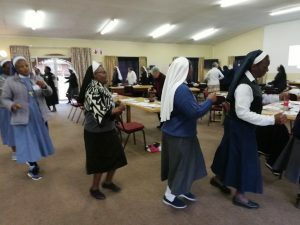 This was done through varied approaches where congregational teams worked together on different exercises and members also worked as individuals, while other exercises required a cross pollination of teams. The facilitators were very innovative and managed to make old stuff look new and their presentations were found to be appealing and a breath of freshness to the teams. Most exercises were found to be very helpful as individuals reflected on their own social styles and the teams together reflected on how they respond to each other through these styles; and how these styles might be the source of conflict thereby necessitating awareness within the team of how they would deal with such conflict. The Cycle of Grace was one other important tool that was used; video clips of the book were presented to highlight the importance of having God as the centre of all that a team does. Teams were encouraged to use these clips not for themselves only but for the rest of the congregation. The participants were also given moments of individual reflection on the scriptures, passages from New Wine in New Wine Skins, guided meditation, etc. There was never a dull moment as participants were made to express their feelings through dance and the days were made colourful through the creative exercises that the teams worked on. In the evaluation, all the teams expressed their gratitude for the workshop and how much difference it has made to their leadership teams. It is said that “all work no play makes Jane a dull girl!” The participants chose not to be dull girls by having a social evening on Mother’s day. This was filled with fun as the different congregations showed off their talents in entertaining the group. For those who could not make it to this workshop, what a pity, you snooze you lose! A follow-up workshop will be helpful and encouraging. More workshops like this are needed. A similar workshop be held for new councillors and new groups that were unable to come. A similar workshop could take place in a period of three years (or every other year). The workshop to be given more days – five days or be given more often. Monitoring and evaluation by another workshop similar to this, to see how far we have come. Workshops on topics such as Theology/Spirituality of Religious Life, Conflict Management etc. will be of great help. A big thank you to the LCCL for arranging this workshop and for your generosity in subsiding it! This went a long way in ensuring that no group was excluded because of financial constraints to participate in this wonderful experience.